Blog Is 77yo Doug really getting younger? We hiked/ran Mount Baldy again this past Sunday (starts at 6,000′ and summit is 10,064′). After we finished I realized I did not have to take my usual 8 or 10 micro-rests (10 or 20 second breaks) during the stomping up the final evil 1.5 steep miles to the top. Now I don’t know if these perceived changes at age 77 are related to taking RECHARGE for just three months, but there have been radical improvements in his cardiovascular efficiency. 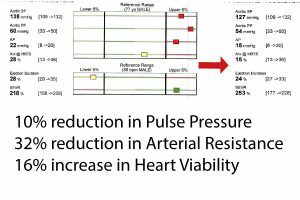 As explained in this blog about pulse pressure, the older we get, the higher the resistance our arteries provide becomes. 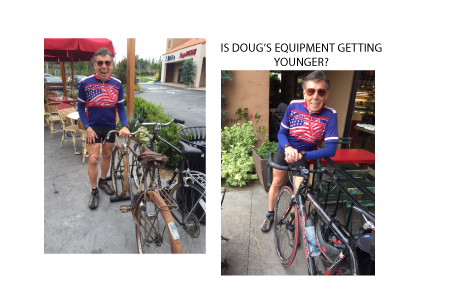 Because Doug is maximized for what he does regularly (run and bike long distances up and down hills), he has a massive heart and powerful muscles. But the stem cells that comprise his arteries are working with certain limitations. They must supply his muscles and brain despite losing propulsive force and elasticity. This is part of his “problem” insofar as he had a whopping 40mmHg pressure difference between his aortic pressure and the resting pressure. I believe that exercise at the age of 77 is problematic because of joint injury, poor repair, and slow and incomplete recovery. In the parallel universe Doug didn’t take the RECHARGE, perhaps he wouldn’t have reaped the benefits of exercise as much but we can never know. All credit goes towards Doug but maybe his little helper of adaptogenic herbs in Recharge is helping him to take advantage of the benefits of exercise by enhancing the cannabinoid system and making stem cell repair more efficient. This is purely conjecture and not meant to be taken as scientifically-validated truth. To learn more about this fundamental biomarker of aging which is the next generation of blood pressure monitoring, watch this video. To understand why I believe that hypertension is not a disease as much as an adaptation for loss of arterial elasticity and propulsion, watch this podcast, which may soon be banned from the internet if the Federal Trade Commission succeeds in their efforts of silencing my free speech. We need to keep people like Doug happy and healthy. They are the future! Kudos to Doug’s partners who signed Lagos, Nigeria up for his visionary SkyTran system and now have signed an MOU with Abu Dahbi as well.